It’s clear from the opening moments, when we hear Freeman’s voice introducing the story as we glimpse a figure in a parka climbing a snowy mountain and wonder if the marching penguins are nearby. A quick flashback later, we’re introduced to Freeman’s character, an auto mechanic named Carter Chambers who has just learned that he has cancer. He sits in his hospital bed, radiating that faintly weary dignity that has become almost oppressively connected to Freeman. Does anyone even remember when he could play someone like the creepy pimp in Street Smart? And why doesn’t his agent look at any script that has him intoning solemn narration and throw it immediately out the nearest window? Sharing Chambers’ hospital room is Edward Cole (Nicholson), billionaire CEO of the private health company that runs the hospital but whose personal assistant (Sean P. Hayes) insists that getting a private room would be bad public relations. Cole is an insensitive, philandering bon vivant who greets life with a grin and a raised eyebrow—in short, he’s playing Jack Nicholson. Soon he has befriended Chambers, and when the two men both get the word that their prognosis is bleak, Cole offers to finance an end-of-life adventure to do all the things they promised they’d get to some day—the “bucket list” of the title. Screenwriter Justin Zackham gives his two protagonists just enough additional substance that it might seem he’s trying to subvert the two actors’ types. Chambers is a trivia junkie whose obsessive need to absorb information hides a fear that he’s never accomplished much with his duties-of-a-father-and-husband life; Cole has an estranged daughter and nothing to keep him company but his money. It’s an autopilot tale of personal growth and uplift, interrupted periodically for broad gags involving the two stars racing around in stock cars or jumping out of airplanes. Everyone—including director Rob Reiner, who clearly never will emerge from dreary hack-work to the talent he showed 20 years ago with The Sure Thing, The Princess Bride and This Is Spinal Tap—appears to have enjoyed their globe-hopping holiday at Warner Bros.’ expense. 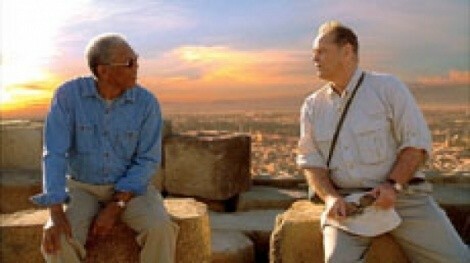 But even if you happen to enjoy the kind of grumpy-old-terminally-ill-men shenanigans on display in The Bucket List, with its life-lesson bullet points and grudgingly earned mutual affection, you have to find it depressing to watch two once-great talents relegated to what is clearly paycheck work. True, taking such roles can often be the only way a senior actor can get work, and not everyone can wrangle the kind of late-career switch that has found Robert DeNiro becoming a comedian. The Bucket List is an example of Hollywood doing what it does best: packaging elements in a way that makes them comfortably familiar to a target audience. How sad that two of those “elements” are talented men, and the “package” is a box in which they may be trapped.